Previously, we saw that the Vampires, led by their unnamed master, were ready for their final blog against the Shogunate of Mitsuko’s father, the current war-leader of the island nation. We saw that both Orochi and Kichiro had fought through some tough times to finally become brothers, that they had both finally heeded their dead father’s teachings and had embraced them. This issue promised to be a right enough capstone for all of that, and to be fair, the story is indeed quite a good one, but there were still too many missteps I feel. One of the things that bothered me till now was that the leader of the Vampires is never named. Is he Dracula? Maybe Lestat? Who is he? Its been a nagging question and it goes unanswered even as the entire story comes to a close. It is perhaps one of the most disappointing aspects of the entire mini-series, and not just this issue. Sure, Dracula and Lestat are horribly overdone in vampire fiction in all mediums, but it would have been nice to see that this big threat is actually a threat. Right now, he just feels like some random villain. The pacing issues are back once more. The big confrontation that was hinted at with the ending of issue #4 is there in its full glory in this issue, but it is something that happens too fast. It essentially comes and goes in the space of a few heartbeats. There’s no sense of scale to it either and there isn’t enough to really get invested in the fact that the Shogunate faces its greatest danger ever, and that it is powerless really to do anything about it. Except keel over and fall dead. Its just weird to do a story like that, especially when its merely an adaptation. I have no idea about the original material, but I’d wager that that at least didn’t have so many issues since it had, essentially, more space to tell the entire story. With the way that Levin works here, a lot of things are left to the imagination, and since there’s no real context or additional info, the imagination just falls flat. And the ending, well its a non-ending really since it switches around just who the protagonist of the story has been so far, Kichiro. The way that the issues comes to a close, you’d think that it was Orochi, arrogant and haughty, who had been the real star all along. It creates a certain dissonance within the story that, I think, goes unresolved. However, the fight scenes, of which there are quite a few, were executed really well. Jessada Sutthi has a clear eye for fast-moving cleanly choreographed action, and it shows up again and again in this issue. The art has generally been a strength of the series, and that holds true for the final installment as well. Art is a major component of any comic and if the art isn’t good, the story isn’t going to be either since they both feed off each other in that respect, although its easier to read a comic with bad story and good art rather than one with good story and bad art. The visual experience counts for a lot and Sutthi makes clear that he is a talented man when it comes to all the artwork in the comic, whether it is pencils or colours or inks or whatever. This review has had a fairly negative tone, so I just want to say that despite all that, this issue was a fun read. Its not everything that I hoped it would be, but it comes close, so I’m willing to give it a pass in that context. More Bushido: #1, #2, #3-4. 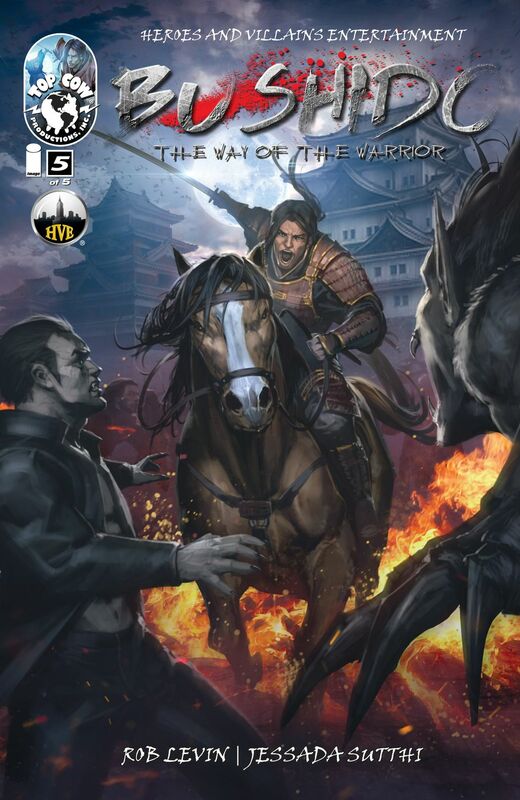 Posted on November 4, 2013, in Comics Reviews, Review Central and tagged Bushido, Comics, Comics Reviews, Feudal Japan, Heroes and Villains Entertainment, Image Comics, Jessada Sutthi, Review, Review Central, Rob Levin, Samurai, Studio HIVE, Top Cow, Top Cow Comics, Troy Peteri, Vampires. Bookmark the permalink. 3 Comments. I think you hit it right on. In my review I seemed to have the same issue with pacing. I noticed the Orochi thing as well now that you mentioned it, and in my interview Levin did say he would like to do a sequel so possibly the reason behind the change of focus was to do a second mini series focusing on him out in the world and fighting against what he is becoming. If he wants to do a follow-up series, then I can see how the ending with Orochi would make sense then, setting up the next phase. Good stuff.